A Syrian soldier films the damage of the Syrian Scientific Research Center which was attacked by U.S., British and French military strikes to punish President Bashar Assad for suspected chemical attack against civilians, in Barzeh, near Damascus, Syria, Saturday, April 14, 2018. From the moment White House chief of staff John Kelly first informed him late last Saturday night that dozens of people in a leafy suburb of Damascus had died choking and foaming at the mouth from another suspected gas attack, President Donald Trump was determined to strike back in Syria. For him, the only question was how. Even with Trump’s jubilant response to the strikes, several advisers close to the president said they had no inclination there was a long-term strategy for the region – and he seems essentially in the same position now as he was after last April’s attacks on Syria. The missile strikes Friday night came at an especially traumatic moment. The commander in chief was increasingly agitated over the past week as legal and personal crises converged around him, exhibiting flashes of raw anger, letting off steam on Twitter and sometimes seeming distracted from his war planning. As the military brass put together the final details on the Syria strike plan, for instance, Trump was following the New York court proceedings involving his personal lawyer, Michael Cohen, and was fixated on media coverage of fired FBI director James Comey’s new memoir. The book paints a scathing portrait of the president’s conduct in office and character, and Trump was personally involved Friday in drafting the scorching statement attacking Comey that White House press secretary Sarah Huckabee Sanders read from her podium on Friday, according to a senior administration official. But in closed-door national security meetings, the tone from top officials was decidedly more nuanced. Hanging over the discussions was concern that a U.S. attack in Syria might provoke a conflict with Russia, which had threatened to retaliate. The absence of a clear strategy in Syria complicated the discussions. Trump had campaigned as a noninterventionist and vowed to withdraw from Middle East entanglements that he decried as costing American lives and treasure. And yet to Trump’s national security team, action of some kind seemed to be a requirement, as officials said they listened to the president deride his predecessor, Barack Obama, for sometimes discussing possible military action and then not delivering it. At a White House dinner last Tuesday, Trump opined that the problems in Syria were caused “because Obama did not enforce his red lines,” according to one attendee, Alan Dershowitz, a retired Harvard Law School professor. Trump was insistent that the strikes impair the production of chemical weapons in Syria, and hoped that would prevent Assad from launching future attacks on his population, according to White House officials. He wanted to inflict more damage than the largely symbolic air assault he ordered in 2017 on a Syrian airfield, which Assad’s forces quickly repaired. Military officials said they took pains to present Friday’s options as larger than the last time, emphasizing that the number of munitions used was roughly double. But as final options were presented, Trump was concerned about U.S. missiles harming civilians. When chemical weapons storage and research facilities were established as the targets, officials said, Trump sought assurances that hitting stock piles might let off plumes that could injure or kill people who lived nearby. 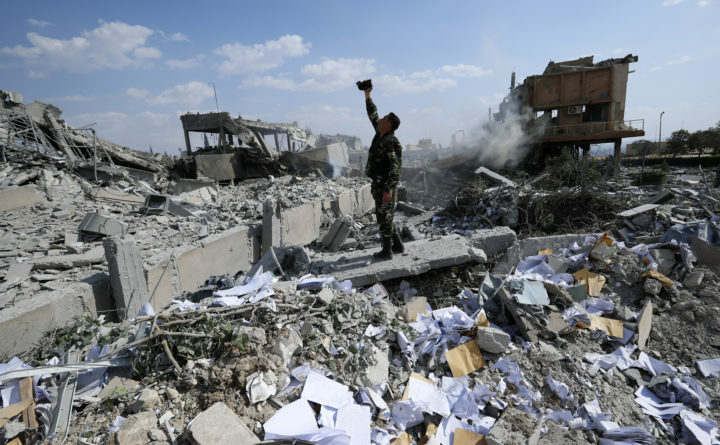 Military officials said Saturday that they believe that no one – not even Syrian government personnel – was killed in the attack, which struck nonresidential facilities in the middle of the night. While options for more expansive actions were also discussed, the plan that Trump ultimately endorsed, with a mix of air- and sea-launched missiles and sophisticated standoff airstrikes, was designed to minimize risk to U.S. and allied personnel and lessen the chances of unwanted escalation, officials said. National security adviser John Bolton, in his first week on the job, was a hawkish voice urging a meaningful show of force that would deter Assad. Trump also heard from some hawks on Capitol Hill, including Sen. Lindsey Graham, R-S.C., who said he urged the president to forgo his plan to pull back troop levels in Syria. “I fear when the dust settles this strike will be seen as a weak military response and Assad will have paid a small price for using chemicals yet again,” Graham said. Trump was characteristically impatient and wanted the military take action quickly, officials said, but Defense Secretary Jim Mattis and Gen. Joseph Dunford Jr., chairman of the Joint Chiefs of Staff, steered a more deliberative and careful process. Mattis and Dunford articulated to Trump the risks involved with operating in Syria, including the possibility of escalation with Russia and Iran, or an unintended event that might drag the United States further into Syria’s civil war, officials said. Military leaders calculated that retaliation from Syria or its allies could come immediately or in a harder-to-detect way, like the insurgent-style attacks that U.S. forces had faced from Iranian-backed militias during the Iraq War. Despite Trump’s urgency to punish the Assad regime, the president allowed Mattis and his military leaders several days to coordinate an allied attack with the French and British, which the Pentagon argued would require naval maneuvers and target coordination among the three countries. Military officials also said they needed time to develop the right targets. While officials had been watching known Syrian chemical sites on and off for years, aerial surveillance time has been dedicated mostly to other areas of Syria, where the United States and allied local forces continue to battle the Islamic State. That meant the U.S. military needed to refresh its intelligence on the chemical facilities before targeteers could build the “target packages” that would guide the operation. As military leaders were busy plotting a strike plan in Washington, U.S. Ambassador to the United Nations Nikki Haley emerged almost immediately as a voice of the administration’s outrage over Assad’s suspected chemical attack – as well as over what she called Russian “disinformation” to protect its Mideast ally. Haley used her position at the United Nations to place the American response in an international context, condemning both Syria and Russia during an emergency U.N. Security Council session on Monday. Hers was a display of traditional American diplomacy – fierce in the defense of civilians allegedly harmed by their own government, confrontational with Russia and mindful of the political and public relations needs of European allies – in an administration that frequently ignores regular diplomatic order. “Only a monster targets civilians and then ensures that there are no ambulances to transfer the wounded,” Haley said Monday. As Haley spoke alongside her counterparts from Britain and France, coordinating her remarks with theirs, Trump was on the phone with British Prime Minister Theresa May and French President Emmanuel Macron to forge a coalition. Spending the week at the White House with a pared back public schedule, Trump was often distracted. On Monday morning, after learning that FBI agents had raided Cohen’s office, hotel room and residence, Trump stewed with anger the remainder of the day. He railed to advisers and friends that special counsel Robert Mueller III’s Russia investigation had grown far too expansive, complained about Attorney General Jeff Sessions and mused about firing Deputy Attorney General Rod Rosenstein. Officials said that Trump made little progress that day on Syria strategy. Trump’s apparent announcement of a missile attack surprised and rattled military leaders. Though the strategy talks were moving in the direction of military action, officials said, no decision had been made about whether, when or how to strike in Syria. It was not until Thursday that military leaders presented Trump final options on targets. Looming over the discussions all week were differing levels of comfort among U.S. officials with the intelligence surrounding the reported April 7 attack in Douma, just outside the capital of Damascus. Almost immediately, military officials identified the killings as more serious than other, smaller-scale chemical incidents that Syrian activists and medical workers had reported in recent months. Within hours of learning of the Douma incident through social media, military officials flagged it for their superiors and began mobilizing retaliatory options for Trump. At U.S. Central Command in Tampa, officials in a dedicated planning cell dusted off earlier scenarios and discussed what sort of action might be taken. In Washington, Mattis and other senior officials talked through a possible strike with the White House. And as Trump conveyed more urgency on Twitter, the pace of Pentagon planning intensified. As they prepared to initiate the strike, U.S. commanders stepped up security measures for U.S. troops across the Middle East, putting a U.S. force of about 2,000 inside Syria, on high alert. Mattis for several days resisted concluding definitively that Assad’s government was responsible for the Douma attack, officials said, saying he had not seen enough evidence that the Syrian government was responsible until last Thursday. But his boss did not share that apprehension. Even before a full intelligence briefing on the incident had been prepared, Trump assigned blame on Twitter last Sunday morning. The Washington Post’s John Hudson and Jenna Johnson in Lima, Peru, contributed to this report.